In most cases, the natural colour of teeth is within a range of light grayish-yellow shades. Teeth naturally darken with age and their appearance can be affected by the accumulation of surface stains. Although teeth are not naturally meant to be completely white, many Canadians want a brighter smile. Responding to this desire, a wide range of whitening options have become available to consumers. These products fall into two main categories: surface whiteners and bleaches. Before purchasing any tooth whitener, you should consult your dentist. Taking into account your unique oral health conditions, your dentist will be able to determine what, if any, tooth whitener is the right one for you. The procedure usually takes 30 to 90 minutes, and one to three visits to the dental office. A protective gel, shield or rubber dam is used to protect your gums from the bleaching agent which is usually a form of hydrogen peroxide. The bleaching agent is then applied or "painted" onto your teeth and heat or high-intensity light is used to enhance the whitening process. This is usually done by applying a bleaching solution to a custom-formed mouthguard that is left in the mouth for a specified time. Some products are intended for twice-daily use for up to two weeks. Others are intended for overnight use for one to two weeks. All toothpastes remove surface stains through the action of mild abrasives. 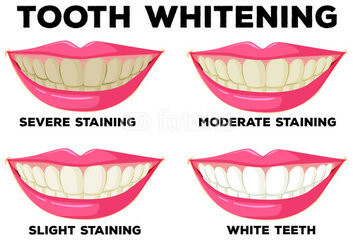 Whitening toothpastes contain special chemicals or polishing agents that have additional surface-stain removing properties, but don’t alter the intrinsic shade of the teeth.